Hurry up, students!! Who has to make their carrier in lectureship & junior research fellowship then fill application form & check notification for CSIR NET 2017(December)exam? The online submission for application form started from 22nd August 2017. 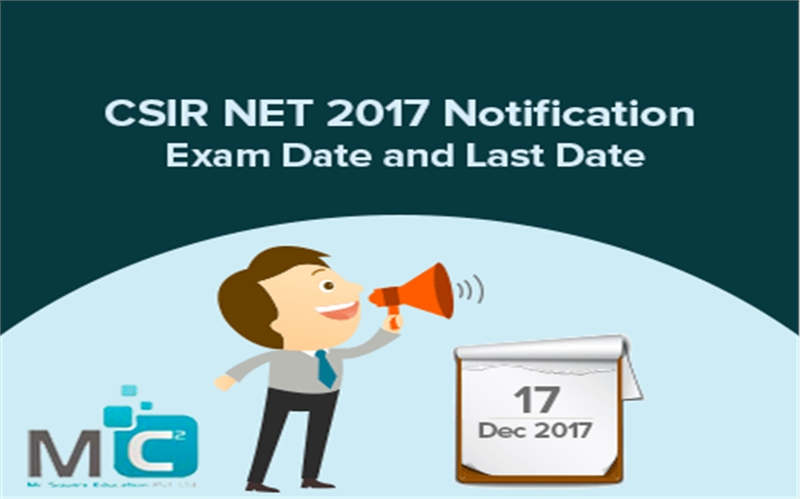 CSIR NET Exam holds on 17th December 2017 on Sunday. The exam will be held in two sessions; at morning from 9 AM to 12nonn & at afternoon 2 PM to 5 Pm. The candidate may apply either JRF or Lectureship only. The candidates may indicate their preference in the online application. If the candidate is found over age for JRF then they automatically considered for lectureship (NET). The candidate with M.Sc. qualification or under M.Sc. result awaited category shall be eligible for lectureship subjects to fulfilling eligibility criteria as laid down by UGC. Eligibility for CSIR NET Exam: Candidate should have M. Sc or equivalent degree with at least 55% marks for general and OBC and 50% for SC/ST. Part A: It contains all subjects. This part shall contain general aptitude like logical reasoning, graphical analysis, analytical & numerical ability, quantitative comparison, series formation, puzzles etc. Part B: It contains subject related MCQ’s. It covers the entire topic in the syllabus. Part C: it contains higher value questions that may test candidate’s knowledge of scientific concepts &/or application of scientific concepts. There are 27 centers spared all over India likeBangalore, Bhavnagar, Bhopal, Bhubaneshwar, Chandigarh, Chennai, Cochin, Delhi, Guntur, Guwahati, Hyderabad, Imphal, Jammu, Jamshedpur, Jorhat, Karaikudi, Kolkata, Lucknow, Nagpur, Pilani, Pune, Raipur, Roorkee, Srinagar, Thiruvananthapuram, Udaipur and Varanasi.